Reading a novel in a matter of a couple of days is rare for me, but this morning I had 150 pages to go, and fairly galloped through it to find out whether what I thought had happened was what did happen. Just for the record, I was partly right, but got a lot wrong, despite the clues that Ellory laid. Death came that day. Workmanlike, methodical, indifferent to fashion and favour; disrespectful of Passover, Christmas, all observance or any tradition. Death came - cold and unfeeling, the collector of life's taxation, the due paid for breathing. In the following years Death visits the small community of Augusta Falls where Joseph lives with his mother, many times, as a serial killer who takes the lives of young girls after doing unspeakable things to them. At school Joseph learns of unbelievable events happening in Europe through the evil of Adolf Hitler, and when, after Pearl Harbour, America goes to war, the murders of the young girls continue, all girls that Joseph knows well. Joseph organises a young band of vigilantes who call themselves The Guardians, but they can do nothing, and when the latest victim is a young Jewish girl, the community of Augusta Falls turns on non-Americans, including the Krugers who live next door to Joseph and his mother. These deaths dominate the path that Joseph Vaughan's life takes and what happens to the Krugers is nothing to what will happen to Joseph Vaughan. Ellory uses the angel's feather icon at least a couple more times in A QUIET BELIEF IN ANGELS. Joseph Vaughan is almost a magnet for Death - it touches those near and dear to him, and sometimes he sees it coming, and sometimes not. As a child and a young man he often sees the workings of Death as his own fault. The events that catch him up in their thrall almost cost him his sanity, but the fact that he is at heart a writer finally helps him to the truth. I have put this book among my top finds for the year, and that is not just for a complex story well told, but also for Ellory's wonderful writing. Last week I saw a book categorised as a "literary thriller" and wondered what that actually meant. 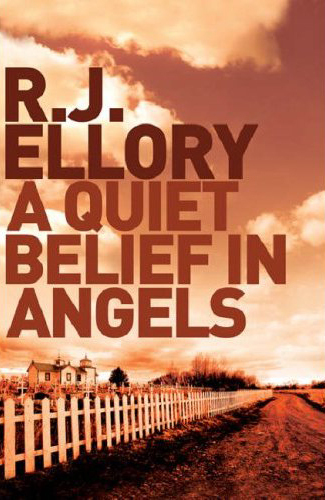 There has been a tendency not to consider crime fiction as having literary merit but I think A QUIET BELIEF IN ANGELS easily straddles both genres. There's a quality in its word pictures that puts it right at the top. This book should win awards!